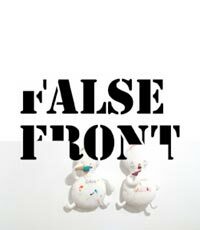 False Front is a project designed to reintroduce surprise and wonder into Lower Manhattan. Located in the South Street Seaport, the exhibition space consists of a series of curated windows on Historic Front Street. False Front is as an auxiliary showplace, working with individual artists, curators and galleries to provide a forum for non-commercial, site-specific work and inter-disciplinary collaborations between emerging and established artists of all (and especially non-traditional) mediums, with a preference for those working in many at once.